Geek, Nerd or Dweeb? : 4 days of happenings!!! Thirstdae Nite :: After work, I straight away went out to see my old school colleague like Yasin Bearwang and Adznan The Razilahairy... Was in the Syed Bangsar for a while.. and get back home.. have a chit chat with ermie and then I went up to sleep. Shatterday :: Went to a wedding at my Village, wedding of a cousin... Phewh. I was driving the non Air-conditioned car.. how pity my bros and sister when we were stucked in the traffic jam from Pedas to Senawang. I was so out of patience.. but I have to.. so reach home.. everyone get down and asleep... At nite, me, my bro, ina and adik went iut walking to a restaurant just nearby our house to have dinner.. Izzat was then screwed up a lil bit and later after being scolded, he ran away.. we finish up our dinner and went back.. even though when ever my sisters were asking about my bro, I said just let him be, in fact, I'm so worried.. Luckily he gets back home.. I was about to start a quarrel but I was just keep quiet then.. I know if i've started, he might end up staying in the hospital..
Shundaye :: A wonderful day, fed the fishes.. they're much bigger now.. yeah for the past two years then.. i guess one of the fish that is still survive weighed at 6-7 kg.. that heavy aite? After packing up everything.. ensure the house is clean and fully locked, i loaded my things inside the car and drive to Tampin for my friend's wedding. This will be fun!!!!! The wedding :: We've got band playin in here. 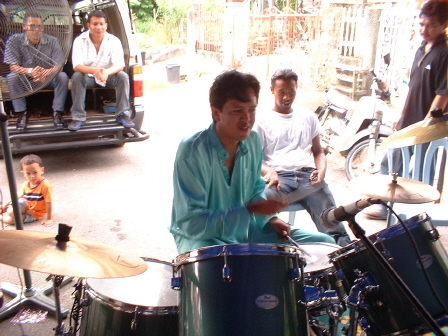 The groom, Rasyidan is one of the best drummer i've ever met. So as he's just finished with his wedding ceremony, he jumped in and hit the drums!!!! And after the crowd were getting less.. 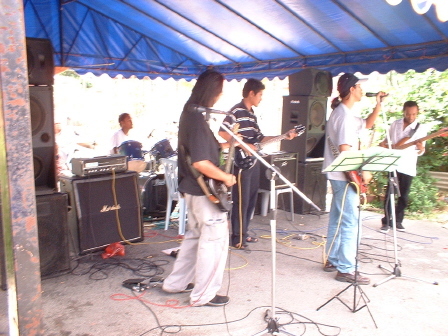 I then joined them... i don't know what we're playin at first... could u guys recognize which one is me? 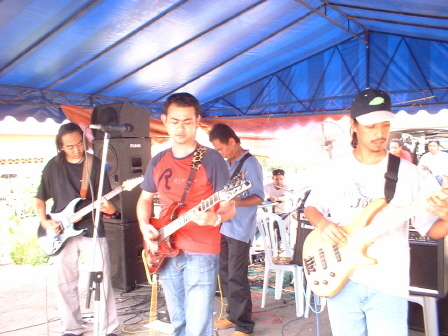 From Left :: Amat(drummer), Me, Joe, Chun and Boncut(bass). Then later when it's getting hotter... we played Metallica!!!! this is the full piece of the metallica playing band!!!! From left :: Me, Zai, Pojee and Chun, while Syidan was one the drum (hidden)... we're really rocking Metallica!!! Then.. I was so tired.. it's so energizing.. we're rockin hard.. so i decided to call it an end and let 'em play.. we rested.. had drinks.. and later me and pojie backed off and we went to a coffee shop in the town and had tea, and had a long chit chat as well.. sent him home.. and drove back to KL.. Jammed :: I'm tired.. why the government has yet do nothing about it.. I was driving from Melaka at 8pm and arrived at KL at around 11.30.. that was long!!! luckily I went through the old road through sepang, dengkil, cyberjaya, serdang KL.. so bad.. the traffic is so bad.. I'm calling the government to do something on this!!!! We're paying the tolls to quicken our journey not to delay it!!!!!!! Huh!!!! !